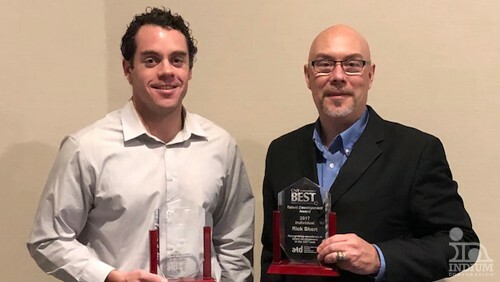 From left to right: Indium Corporation’s Jim McCoy and Rick Short have been awarded the CNY BEST Award for Individual/Team by the CNY chapter of the Association for Talent Development. Indium Corporation proudly announces that Rick Short, Corporate Associate Vice President and Senior Director of Marketing Communications, and Jim McCoy, Talent Acquisition Supervisor, have been awarded the CNY BEST Award for Individual/Team by the CNY chapter of the Association for Talent Development (ATD). Short and McCoy were recognized for their passion, foresight, and continued participation in helping to make the Oneida-Herkimer-Madison BOCES (OHM BOCES) Pathways in Technology Early College High School (P-TECH) program a success. P-TECH is a public-private partnership that takes high school students out of traditional classrooms and implements an integrated educational approach to prepare them for high-skills jobs of the future. Short and McCoy have been involved since the start of the OHM BOCES program, providing students practical knowledge and the opportunity to apply their skills to real-world projects. Indium Corporation was also nominated for a corporate award for their Summer College Internship Program. Company representatives have been invited to participate in a facilitated best practices session with CNY ATD to share successes with other organizations that are considering growth or enhancement of their internship programs. “Sharing the Best” will be held from 8:30-10 a.m. on Jan. 16 at OneGroup, 706 N Clinton St, Syracuse, NY. Short has been with Indium Corporation for more than 30 years. As Corporate Associate Vice President, Short ensures that all programs and initiatives align with corporate branding and culture. This includes oversight of community engagement activities, and image and reputation management, all supporting the company’s philosophy of The Indium Way. As Senior Director of Marketing Communications, Short creates and enhances global communications, aligning strategies and activities. He has an MBA from Rensselaer Polytechnic Institute, a bachelor’s degree in Business Management from Utica College, and an associate degree from Mohawk Valley Community College. McCoy is responsible for enhancing recruiting efforts, attracting top talent, and engaging in strategic community outreach activities to develop contact with groups and organizations. He also manages Indium Corporation’s internship program. McCoy joined Indium Corporation in 2014 as Talent Acquisition Coordinator. He earned a bachelor’s degree in Business Administration from Western New England College and is working on his Master of Business Administration degree from the State University of New York Polytechnic (SUNY Poly) in Utica, NY. He is a Lean Six Sigma Yellow Belt and a graduate of the Dale Carnegie Leadership Skills for Success Program. McCoy is a member of the Herkimer BOCES curriculum advisory committee and serves on the Oneida-Herkimer-Madison P-TECH board.